Class I milk | Ag Moos "Growing the Land"
Global dairy thoughts Part II: Who’s being creative? BROWNSTOWN, Pa. — Everywhere we turn, we receive the message that fresh fluid milk is a market of the past and exports of less perishable dairy products are the wave of the future. As discussed in Part One of this ‘global dairy thoughts’ series, that seems to be the trend if you look at the markets. Yet, could a portion of the reason we are in this fluid milk decline, be the effect of USDA-regulated pricing, USDA-imposed restraints on the ability to promote competitively in the beverage space, and the resulting industry neglect of this regulated commodity category — fresh fluid milk? The government — USDA — and the checkoff and cooperative leadership have no appetite for significant change to any of these factors. USDA gets to pay less than it otherwise might for milk in its nutrition assistance programs, while both the proprietary and cooperative processors get to pay less than they might otherwise for components in a range of products. Meanwhile, dairy farms see the first product to come from their herds — milk — declining, and their futures along with it. Yes. We all know it. Fresh fluid milk — the most nutritious and natural option — is in the fight of its life. In meeting after meeting, presentation after presentation, we hear the messages from the industry and university economists — both subtly and outright. It is difficult to question the industry and its economists on anything to do with the Eastern U.S. or the fluid milk market. Some have gone so far as to say that if the East is relying on fluid milk, they are out of luck. 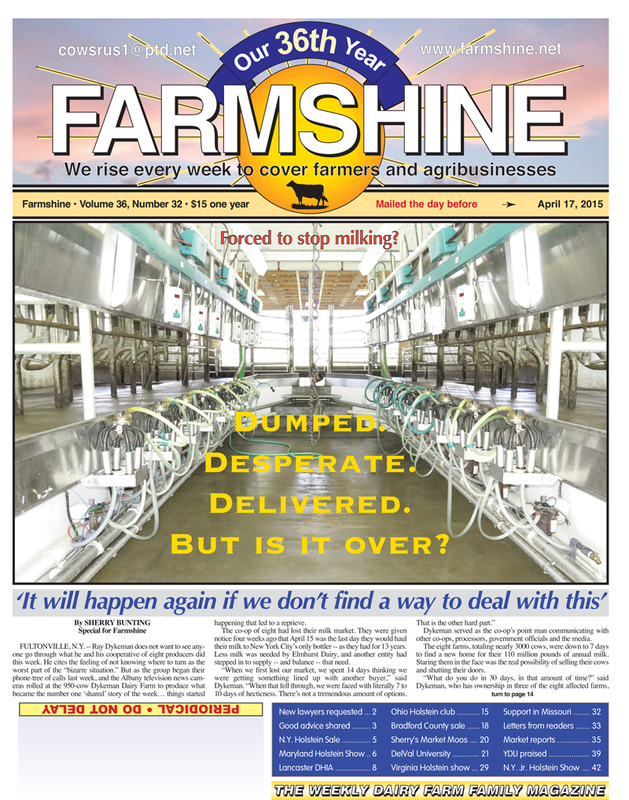 Meanwhile, dairy farmers in eastern regions suggest that if fluid milk does not stabilize its losses or restore its market share — at least partially — they see their value as producers vanishing. And in fact, this has an impact on our global advantage — that being the U.S. having a large consumer base at home to anchor the base production while growth is said to be the reason why we need exports. 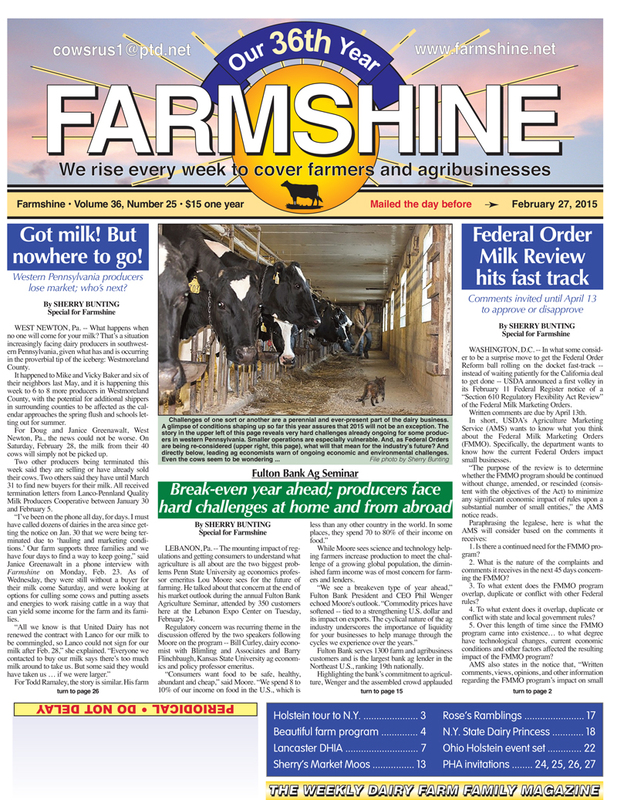 As mentioned briefly in Part One, the Federal Orders are designed to move the milk from surplus regions to deficit regions, and that is what the proposed USDA change in Orders 5 and 7 will do further, the experts say. Meanwhile, who is being creative to figure out how the deficit regions of the East can use or regain their primary competitive advantage — having a base of consumers within a day’s drive. This line of thinking is analogous to how the U.S. fits as an exporting nation with quite a large consumer base at home. What really requires our creativity is the U.S. product mix and how milk resources are priced and sourced. Here are some numbers. U.S. dairy protein disappearance has had average annual growth of 6.3% over the past five years, though it has been a bumpy ride, with U.S. production of milk protein concentrate (less exports) at its lowest levels over that five-year period in 2014. Meanwhile, demand for fat is increasing as consumers heed the dietary revelations and switch from lowfat and fat-free milk to whole milk and have their butter without guilt. Mentioned last week in part one is that global milk production increases are beyond the stable rate of 1.5% per year. According to the U.S. Dairy Export Council (USDEC), the combined growth rate from the EU-28, U.S., New Zealand, Australia and Argentina was double that collective 1.5% threshold. Looking at 2018, however, reports are surfacing to show spring flush is delayed in Europe just as it appears to be in the U.S.
Or is global production reining in? The markets are trying to figure that out with quite a rally going in powder right now. One thing rarely mentioned in these reports is that Canada’s production has also grown with increased quota to account for the greater demand they see in their domestic market for dairy fat. In fact, despite its supply management system, government figures show Canada’s milk production had year-over-year growth between 3 and 6% for each of the past three years, and 2018 production is off to a 5% start. In Canada, as in the U.S., fat fortunes have changed over the past four years, so the belt has been loosened to serve that market, leaving more skim swimming around. Canada’s new export class (Class 7) mainly pertains to this excess skim, which has reduced the amount of ultrafiltered milk they now buy from U.S. processors. In addition, as pointed out by Calvin Covington in his presentation at the Georgia Dairy Conference in January, milk can be purchased at lower prices for this Canadian export Class 7 because the excess skim is used in products that are then exported. This means the resulting products in the Canadian export class can be sold at globally competitive prices. While not in huge volumes, some of this product is going to Mexico. This brings us to Mexico — currently the largest buyer of U.S.-produced nonfat dry milk, making the outcome of NAFTA negotiations a sticky issue for industry leaders, especially as Mexico recently signed a trade deal with the EU to include dairy. The two forks come together in regions like the Northeast, where Class IV utilization has become an increasing part of the blend price and a more important balancer of the shrinking Class I. While March showed a surprising jump in Class III utilization to a 15-year high in the Northeast, the overall trend over the past four years has been a blend price with increasing Class IV utilization and decreases in Classes I, II and III. Dairy economists indicate the U.S. is making more world-standard skim milk powder for export, but in reality, the U.S. still makes a high percentage of nonfat dry milk (NFDM), which is still the largest domestically-produced milk powder category and it is the only milk powder that is used in the Federal Order pricing formulas. NFDM is primarily made in conjunction with butter. As butter demand has grown and prompted greater butter production in the U.S. over the past four years, more NFDM has been made and stored (or the skim is dumped) as a result. The market issue in the U.S. has been compounded by the EU having a mountain of intervention powder stocks in storage, some of it aging. After the European Commission sold over 24 metric tons two weeks ago, global and domestic powder markets moved higher. It was the largest chunk to come out of that mountain to-date and was offered at reduced prices to attract buyers. But by the time the bidding was done, it sold at or above the GDT price for SMP powder. It’s really true. Inventory depresses prices. Having a big chunk of a huge inventory gone, is, well, big. The flip side of the coin is that European processors have shifted from powder production with their excess to making more cheese and butter. Next in Part Three, we will look specifically at some differences between the products made in the U.S. vs. what is traded globally, and at the differences between the U.S. and global trading platforms.